This item has been discontinued. 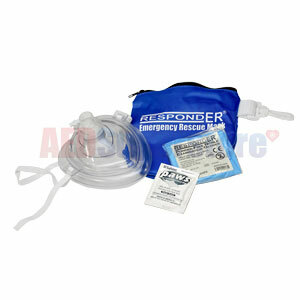 Please see RespondER® CPR Mask W/ Gloves & Wipe In Hard Case for an alternative. CPR RespondER Mask in Soft Blue Bag w/Wipe & Gloves. We've got the best price on this durable, latex-free CPR mask which includes a one-way valve with filter and an oxygen barb for the administration of supplemental oxygen if desired. Its form fitting face piece makes it great for adult and child patients alike and it comes in a sturdy crush-resistant case. This mask will fit most resuscitators, too (such as the AMBU SPUR II BVMs).